It is 404 years today since "The History of Don Quixote" was published — the first modern novel. It's a book that has inspired many artists and composers — the first image that comes to my mind when I think of the book is Pablo Picasso's Don Quixote, but a search on the web showed many more paintings called Don Quixote. Here are just a few, you can see more at my Swedish blog. 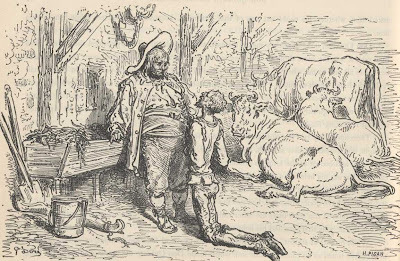 The English translation you can find at Gutenber has illustrations by Gustave Doré.